Phil Dowson says the return to Challenge Cup action is a chance for Saints to 'get our heads right'. 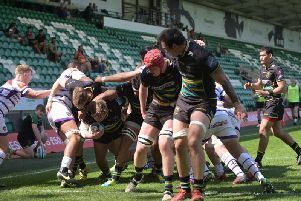 The black, green and gold have lost to the Gallagher Premiership's bottom side in each of the past two weeks, suffering defeat at Sale Sharks before enduring late despair at the hands of Newcastle Falcons last Saturday. It has left them sitting 10th in the league standings with nine games gone. And Saints are now in desperate need of a boost before they travel to Worcester Warriors for another key Premiership clash four days before Christmas. Prior to that, Chris Boyd's men host the Dragons, with a trip to Romanian minnows Timisoara Saracens coming a week later. And Dowson said: "It gives us an opportunity to get our feet back on the ground and get our heads right for the Premiership. "It gives guys a chance to rest and it gives opportunity for guys to play who haven't played enough. "It gives us a chance to try different things but most of all, it's an opportunity to get to the knock-out stages. "We want to be playing at the top level, against sides like Montpellier and Saracens. "But this competition gives us a different opportunity, to get over the disappointment of last weekend and get some momentum back into the team." Saints have already beaten the Dragons this season, slaying the Welsh region 35-21 at Rodney Parade in October. The black, green and gold also won there in pre-season. But forwards coach Dowson knows the Dragons will be a wounded animal after suffering a 59-10 home humiliation at the hands of Leinster last weekend. "They took a hiding last weekend against Leinster and Richard Hibbard has already been saying in the paper that they want to make sure they put on a big show here," Dowson said. "They will come fully loaded and it's two sides who really have a point to make. "It's not going to be anything other than full on, which is good."